Posted 13.11.2016 by Fascinating Rhythm & filed under Competition. We’re thrilled to bits to have improved our score again this year by a whole 2 points and hold on to our 5th place. We’ve still a way to go before scoring high enough to get into the top 3 but we’re more consistent now and improving year on year. Two points may not seem like much, but considering there was only 0.6 between us and the 4th placed Chorus and 0.4 for the one biting our ankles you can see just how tight the competition is. We’re judged in three categories: Music (the arrangement), Presentation & Singing; looking at the scores, we were actually 4th in Presentation, so we dun good getting the interpretation of the songs across. Our new dresses looked good under the stage lights too, very sparkly. We had both of our songs especially arranged for us again this year by Liz Garnett: ‘Is You Is or Is You Ain’t My Baby’ and ‘Someone to Watch Over Me’. Apparently, we’re the first chorus to bring two totally new arrangements to two consecutive conventions; hope this sets a trend – there’s so many great songs out there just waiting to be arranged and sung in the barbershop style. We’re aiming to make it three in a row and bring two ones to Eastbourne in 2017. 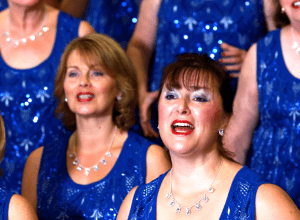 During 2016, LABBS (Ladies Association of British Barbershop Singers) are celebrating 40 years of glorious harmony and, as with every Convention, all the clubs are sent a song to learn so we can raise the roof together. As this is a special year, we were sent no less a challenge than … Bohemian Rhapsody! If you’d like to hear what it sounds like sung by 2,000 women, led by multiple gold medallists The White Rosettes chorus and their MD Sally McLean—visit www.labbs.org.uk (scroll middle column just above White Rosettes). At this point, we’d again like to say a huge Thank You to all Friends of FR and to our families for the support you give us throughout the year; we had over 200 guests at our dress rehearsal and it really makes such a difference to have you there.